The Red-bellied Malimbe was formally described by Anton Reichenow, a German ornithologist and herpetologist. The Red-bellied Malimbe was collected by Georg August Zenker, a German zoologist and botanist. In 1886 Zenker accompanied Italian explorers on an expedition to the lower reaches of the Congo River, where he then settled on a plantation in Gabon. The company had to give up the plantation in 1889, so the company owner made Zenker head of the research station at Yaounde in the interior of Cameroon - Zenker remained here from 1889-1895. Zenker collected 5000 plant specimens and a number of birds which were sent to the Berlin Museum. Zenker collected two Red-bellied Malimbes, a male and a female, sometime between 1889 and 1893, probably closer to 1893. The types are in the Berlin Museum. Zenker also collected the Yellow-capped Weaver in the same time period but probably before the Red-bellied Malimbe as the weaver was described first. The first illustration of the Red-bellied Malimbe was of the type male and female, published by Reichenow (1896). The next illustration was by Ogilvie-Grant 1910 of the male. Malimbus erythrogaster	Reichenow 1893c,	Orn. Monatsb., 1, p.205, Jaunde, Cameroon. erythrogaster, Greek: Eruthros, red; gaster, the belly. 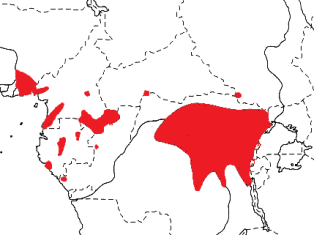 Red-bellied Weaver, Red-breasted Malimbe, Semliki Red-bellied Malimbe. The types are in the Berlin Museum (ZMB_31798, ZMB_31799). Identification. 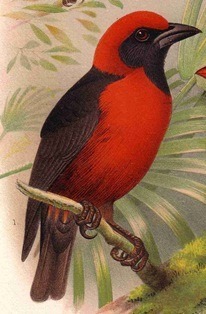 The Red-bellied Malimbe is the only malimbe with entirely red underparts from the breast to the vent; the vent may be black in eastern populations, however. The red head and black face are shared with several other malimbe species. 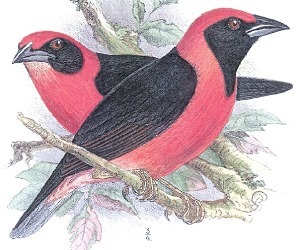 The female is similar to the male but has a orange-red chin and throat, and is paler below. The juvenile is duller and browner than the female. Distribution. 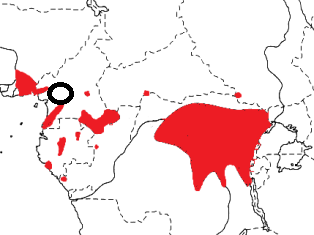 The Red-bellied Malimbe is found in Nigeria, Cameroon, Central African Republic, Equatorial Guinea, Gabon, PRCongo, and DRCongo (see map below, based on Birds of Africa). There are no subspecies and the Red-bellied Malimbe is poorly known. Habitat. The Red-bellied Malimbe inhabits high canopy in the interior of dense lowland forest, keeping at least 25 m from the forest floor. It also occurs in open dry forest and secondary forest. It is usually in pairs or small family parties. The Red-bellied Malimbe joins mixed-species foraging flocks. It regularly perches on dead branches at the top of trees. Food. The Red-bellied Malimbe feeds on insects including beetles, caterpillars, bugs, grasshoppers and their eggs. It also feeds on small snails, some fruit and some small seeds. It forages in open tops of emergents and in thinly leaved trees, amongst clusters of dead leaves, and on dead branches and trunks. Breeding. The Red-bellied Malimbe is usually a solitary nester but may be colonial. It appears to have helpers at the nest. The nest is a well-woven globular chamber with an entrance tube 18cm long. 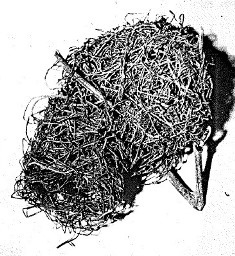 The nest is placed very high in forest, in thick outer foliage, or attached to branches of tall trees. It is woven of pieces of small vines. The long spout seems to be added during the rearing of the young. The eggs are unknown, and nothing else is known about its breeding habits. Nests may be clustered in the same tree as the nest of Crowned Eagles Stephanoaetus coronatus, which provides protection from monkeys.